Since the 1920s, Sea Scout Ships have both names and numbers. Ship 461 is also Sea Scout Ship Nautilus (461), or simply S.S.S. Nautlius. While many nautical terms and creatures are pretty self-evident or well-known, some are not. Ship 461 chose the name "Nautilus" for several reasons - first is the nautical sea creature of that name, second from the name of the submarine in the Jules Verne work titled "Twenty Thousand Leagues Under the Sea," and finally for the first nuclear-powered submarine in the United States Navy and the first vessel to sail submerged under the North Pole. Nautilus is the common name given to a group of marine creatures of the cephalopod family Nautilidae, the sole surviving family of the superfamily of Nautilaceae and of its smaller but near equal suborder Nautilia. It comprises six living species in two genera, the type of which is the genus Nautilus. Though it more specifically refers to species Nautilus pompilius, the name chambered nautilus is also used for any species of the Nautilidae. The Nautilus is similar in general form to other cephalopods, with a prominent head and tentacles. Nautiluses typically have more tentacles than other cephalopods, up to ninety. These tentacles are arranged into two circles and, unlike the tentacles of other cephalopods, they have no suckers, and are undifferentiated and retractable. The radula is wide and distinctively has nine teeth. There are two pairs of gills. These are the only remnants of the ancestral metamerism to be visible in extant cephalopods. Nautilus pompilius is the largest species in the genus. One form from northwestern Australia, once called Nautilus repertus, may reach 26.8 centimeters (10.6 in) in diameter. However, most Nautilus species never exceed 20 centimeters (7.9 in). Nautilus macromphalus is the smallest species, usually measuring only 16 centimeters (6.3 in). A dwarf population from the Sulu Sea (Nautilus pompilius suluensis) is even smaller, with a mean shell diameter of 115.6 millimeters. Nautiluses are the sole living cephalopods whose bony body structure is externalized as a shell. The animal can withdraw completely into its shell and close the opening with a leathery hood formed from two specially folded tentacles. The shell is coiled, aragonitic, nacreous and pressure resistant, imploding at a depth of about 800 meters (2,600 ft). The nautilus shell is composed of 2 layers: a matte white outer layer, and a striking white iridescent inner layer. The innermost portion of the shell is a pearlescent blue-gray. The osmeña pearl, contrarily to its name, is not a pearl, but a jewelry product derived from this part of the shell. The shell coloration also keeps the animal cryptic in the water. When seen from above, the shell is darker in color and marked with irregular stripes, which helps it blend into the dark water below. The underside is almost completely white, making the animal indistinguishable from brighter waters near the surface. This mode of camouflage is named counter shading. The nautilus shell presents one of the finest natural examples of a logarithmic spiral, although it is not a golden spiral. Nautiluses are only found in the Indo-Pacific, from 30° N to 30° S latitude and 90° to 175° E longitude. They inhabit the deep slopes of coral reefs. Nautiluses usually inhabit depths of several hundred meters. 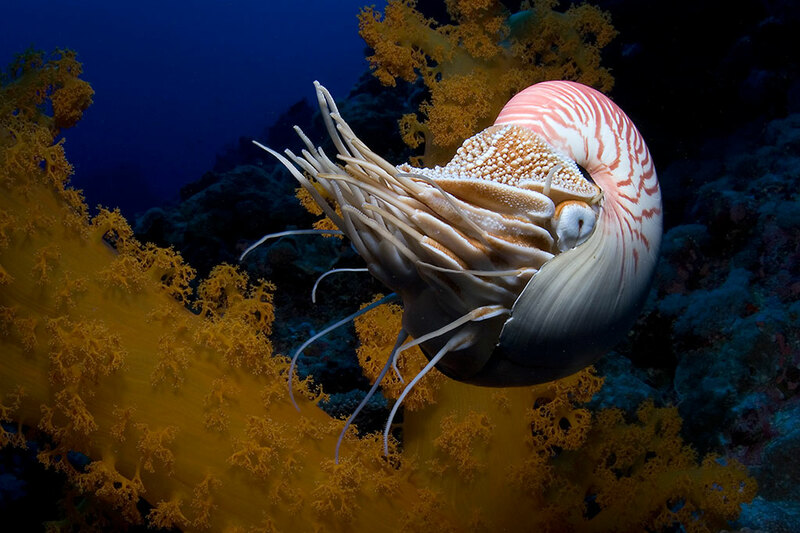 It has long been believed that nautiluses rise at night to feed, mate and lay eggs, but it appears that, in at least some populations, the vertical movement patterns of these animals are far more complex. 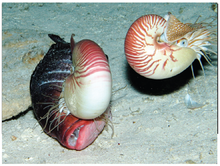 The greatest depth at which a nautilus has been sighted is 703 m (N. pompilius). Implosion depth for nautilus shells is thought to be around 800 meters. Only in New Caledonia, the Loyalty Islands, and Vanuatu can nautiluses be observed in very shallow water (at a depth of as little as 5 meters). This is due to the cooler surface waters found in these southern hemisphere habitats as compared to the many equatorial habitats of other nautilus populations (these usually being restricted to depths greater than 100 meters). Nautiluses generally avoid water temperatures above 25°C. There is growing concern that nautiluses are being greatly overfished. Their limited ecological range and the late onset of their sexual maturity combined with this over fishing has led to recent investigations into the need to protect them from possible endangerment or extinction. Nautiluses are scavengers and opportunistic predators. They eat molts of lobsters, hermit crabs, and carrion of any kind. 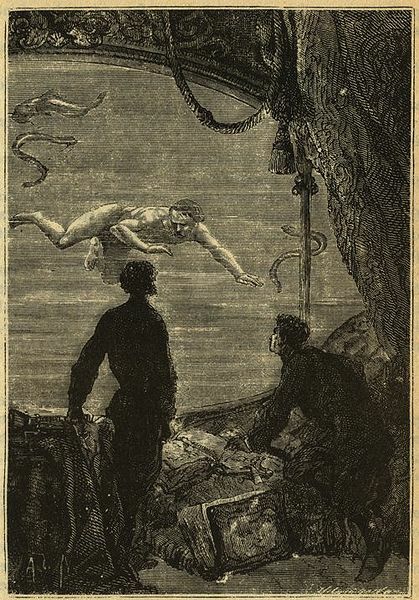 In his work Twenty Thousand Leagues Under the Sea (1870), Jules Verne named the futuristic submarine captained by Captain Nemo the Nautilus. Jules Verne named his submarine the Nautlius after Robert Fulton's submarine, also called the Nautilus. According to Jules Verne, Captain Nemo's Nautilus was powered by electricity that was provided by sodium/mercury batteries which serve as the vessel's primary power source. The Nautlius is a double-hulled vessel, separated into several water tight compartments, that is capable of reaching a top speed of 50 knots. It has a displacement of 1,356.48 French tons. The Nautilus uses floodable tanks in order to adjust buoyancy and so control its depth. The pumps that evacuate these tanks of water are so powerful that they produce large jets of water when the vessel emerges rapidly from the surface of the water. This leads many early observers of the Nautilus to believe that the vessel is some species of whale, or perhaps a sea monster not yet known to science. To submerge deeply in a short time, Nautilus uses a technique called "hydroplaning", in which the vessel dives down at a steep angle. The Nautilus supports a crew that gathers and farms food from the sea. The Nautilus includes a galley for preparing these foods, which includes a machine that makes drinking water from seawater through distillation. The Nautilus isn't able to refresh its air supply, so Captain Nemo designed to do it by surfacing and exchanging stale air for fresh, much like a whale. The Nautilus is capable of extended voyages without refueling or otherwise restocking supplies. Its maximum dive time is around five days. Much of the ship is decorated to standards of luxury that are unequaled in a seagoing vessel of the time. These include a library with boxed collections of valuable oceanic specimens that are unknown to science at the time, expensive paintings, and several collections of jewels. The Nautilus also features a lavish dining room and even an organ that Captain Nemo uses to entertain himself in the evening. By comparison, Nemo's personal quarters are very sparsely furnished, but do feature duplicates of the bridge instruments, so that the captain can keep track of the vessel without being present on the bridge. These amenities however, are only available to Nemo, Professor Aronnax and his companions. The USS Nautilus (SSN 571) was the world's first operational nuclear-powered submarine and and was the first vessel to complete a submerged voyage to the North Pole on 3 August 1958. The USS Nautilus was authorized by Congress in 1951 and she was launched in 1954. She was commissioned into the United States Navy on 3 September 1954. The USS Nautilus (SSN 571) was named after both the submarine in Jules Verne's work, Twenty Thousand Leagues Under the Sea, as well as a previous submarine, the USS Nautilus (SS-168), which served with distinction in the Second World War. It was actually the sixth vessel in the United States Navy to bear that name. The keel for the USS Nautilus (SSN 571) was laid on 14 June 1952 at the Electric Boat Division of the General Dynamics Corporation at Groton, Connecticut. She was launched on 21 January 1954 and sponsored by First Lady Mamie Eisenhower. The USS Nautilus was commissioned into the US Fleet on 30 September 1954 and her first commanding officer was Commander Eugene P. Wilkinson. At 11:00 o'clock a.m. on 17 January 1955 the USS Nautilus put to sea and signaled her historic message, "underway on nuclear power." The USS Nautilus has a length of 323.8 feet, a beam of 27.8 feet, and a displacement of 3533 tons when surfaced and 4092 tons when submerged. She has a top speed of 22 knots on the surface and 25 knots when submerged. The Nautilus' test depth was 700 feet and she had a crew of 13 officers and 92 enlisted men. The USS Nautilus was armed with six 21 inch torpedo tubes. 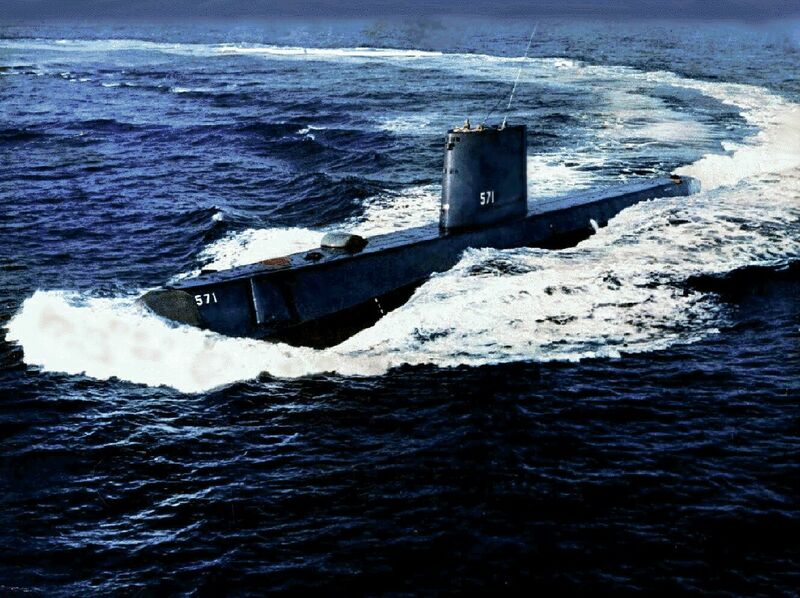 The USS Nautilus was decommissioned on 3 March 1980 and stricken from the U.S. Navy's register of ships. During her years of service, she made 2,507 dives and cruised 513,550 nautical miles. In 1982 the USS Nautilus was designated a National Historic Landmark by the Secretary of the Interior. She was named the official state ship of the State of Connecticut in 1983. Following an extensive conversion at Mere Island Naval Shipyard, the USS Nautilus was towed to Groton and is currently preserved as an exhibit at the Submarine Force Library and Museum. In 2002 She underwent a further five-month restoration at the Electric Boat Division of General Dynamics in 2002 at a cost of 4.7 million dollars. On 30 September 2004, the USS Nautilus celebrated the 50th anniversary of her commissioning with a ceremony that included a speech by Vice Admiral Eugene P. Wilkinson, her first commanding officer. She was also designated as a National Nuclear Landmark by the American Nuclear Society that same day. The USS Nautilus is currently open to visitors at Groton and serves as a Museum of Submarine History. She is berthed near the Naval Submarine Base New London. Visitors may visit her forward two compartments with guidance from an automated system. The engineering compartments are not open to visitors for safety and security concerns. She receives approximately 250,000 visitors per year. This page last updated on 09 September 2012.